Experience New Zealand as early Polynesians and explorers once did—by exploring its coastlines by ship. 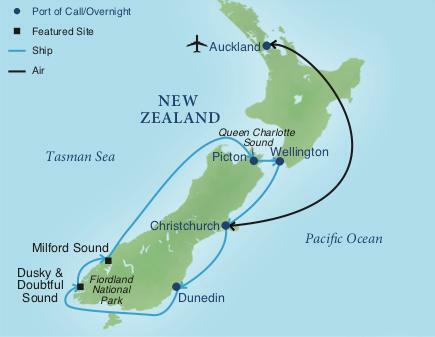 Make a complete circumnavigation of the South Island aboard a deluxe small ship and enjoy time exploring Auckland. I have been with various travel groups but this trip was better than any I've ever been on. Everything was well planned; these guys had it to down to a science. On most tours at least one thing goes wrong, but not with Smithsonian. They're total experts and professionals and I can't think of anything that they could have done better. 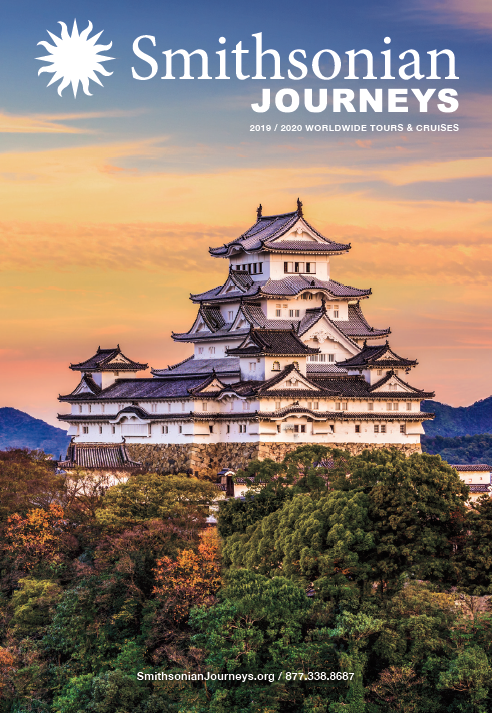 Save $1,000 per person when you book by July 12, 2019! New Zealand is a country of breathtaking natural beauty, astonishing flora and fauna, and towns and villages reflecting distinctive personalities. Join us to circumnavigate the South Island by ship, just as early Polynesians and explorers did, and explore the World Heritage Site of Fjordland National Park with Milford, Dusky and Doubtful Sounds. Your Zodiac adventures feature panoramic vistas, plunging fjords, mystical waterfalls, lush forests and amazing birdlife of the South Island. Tour charming Christchurch, “the most English city outside of England.” On the North Island, enjoy four nights visiting the “City of Sails”, Auckland, featuring the Auckland War Memorial Museum with its superb collections of military history and Maori treasures and a call in the country’s capital city of Wellington. Fiordland National Park: Cruise the breathtaking landscapes of the World Heritage site – including Milford Sounds and Dusky and Doubtful Sounds–over two exciting days. Enjoy Zodiac rides that feature panoramic vistas and up-close looks of plunging fjords, mystical waterfalls, lush forests, and glacier-grooved cliffs. Stunning Destinations: From Dunedin to the west coast admire amazing birdlife such as the northern royal albatross (the largest seabird in the world) and rare species of penguin, as well as bottlenose dolphins, sea lions, whales, and other marine wildlife. Cultural Sites: Tour charming Christchurch, "the most English city outside of England," and the country's capital city of Wellington, a historic site for the Maori people. Auckland and Marlborough Valley: Enjoy two days exploring the “City of Sails,” featuring the Auckland War Memorial with its Maori treasures. Visit New Zealand’s wine region, the Marlborough Valley, plus stop at a farm to watch traditional sheep shearing and herding demonstrations. Le Laperouse: Launched in 2018, Le Lapérouse is among a new fleet of luxury expedition ships launched by the Ponant cruise line. This ship combines revolutionary design and a new standard of luxury. See more information about this ship on the Tour Details page. Each voyage will also host other leading cultural and educational institutions, which will add to the excitement and energy of the experience. Depart home on an overnight flight to Auckland, the “City of Sails,” on New Zealand’s North Island. Lose one day crossing the International Date Line. Arrive in the morning at Auckland International Airport and then transfer to the Pullman Auckland Hotel where rooms will be ready for your early morning arrival. Stop by the Hospitality Desk for any help during your time in Auckland. After breakfast, travel a short distance to the Auckland War Memorial Museum to view its extensive collection of exhibits on the Cultures of New Zealand and the Pacific Islands. The Collection features the world’s largest assortment of Maori taonga (treasures). Marvel at the special performance of the Museum’s cultural performance group, the Haka Legend. Through their traditional stories, chants, dancing, they provide an insight into Maori mythology, genealogy, and spirituality. The cultural sharing culminates in the celebrated Maori haka dance. (traditional war cry or challenge). The morning tour continues with a panoramic tour of Auckland situated between two different bodies of water—the Tasman Sea and the Pacific Ocean. The central part of Auckland showcases a contrast in architectural styles with modern skyscrapers in harmony with restored Victorian buildings and Colonial-style shops. Your stop at one of the many vantage points provides stunning views of Auckland’s harbor and skyline. Visit black-sand Muriwai Beach for spectacular views of the Tasman Sea. See the Muriwai Gannet Colony, one of only three mainland gannet colonies in New Zealand and observe thousands of pairs of gannets tending to and protecting their chicks. Meet friendly, local Kiwi and enjoy light refreshments at a family-run farmstead. New Zealand is home to over 27 million sheep, a ratio of six sheep for every person. Your introduction to this important agricultural sheep ranching tradition will be enhanced with a specially arranged sheep herding demonstration, highlighting the New Zealand Huntaway sheep dog’s essential role in high country sheep station farming. Fly from Auckland to Christchurch, known as “the most English city outside of England,” named after Christ Church College at Oxford University and the oldest established city in New Zealand. The panoramic tour introduces you to this vibrant city in transition, where the restoration of Victorian architecture recaptures the provincial charm of Britain as a renaissance of new structures emerges along the Avon River. Visit the New Zealand Heritage site of Mona Vale. See the late-19th-century homestead designed by J.C. Maddison, responsible for the English-inspired architecture in Christchurch. Enjoy a guided tour of the gardens and fernery built to showcase the indigenous silver leaf fern in the 1907 New Zealand International Exhibition. See the prominent Cathedral Square, the heart of Christchurch. Arrive in Dunedin, noted for its rich Scottish heritage, even having its own tartan. Dunedin is surrounded by dramatic, rolling hills with endless scenic vistas. See the Octagon—the eight-sided town center—and visit the grand, 1906 Flemish Baroque-influenced Dunedin Railway Station, one of the most photographed railway stations in the world. Tour historic 20th-century Olveston, the English Country house in the city and home of the philanthropic Theomin family. Enter the UNESCO World Heritage-designated Te Wähipounamu, where, according to Māori legend, the demigod Tu Te Raki Whanoa created what is now New Zealand’s stunning Fiordland National Park, comprised of spectacular ice-carved fiords, rugged snow-topped mountains, and deep valleys. Cruise the beautiful coves and islets of Queen Charlotte Sound, where Captain Cook anchored the HMS Endeavour in 1770. Look for spotted shags perched on rocks and the endangered Hector’s dolphin frolicking nearby. The seaport of Picton serves as the gateway to the Marlborough District, New Zealand’s largest wine region and internationally acclaimed for its sauvignon blanc. Transfer through the fertile Wairau Valley to Blenheim and enjoy a wine tasting and tour; the area has rich alluvial soil, creating a unique terroir ideal for winemaking. Tour the 19th-century Old St. Paul’s wooden cathedral, one of the finest examples of Gothic Revival architecture in the world. See where the U.S. flag (with 48 stars) hangs as a reminder of the importance this church held to U.S. soldiers stationed here during World War II. Enjoy spectacular views of Wellington and Cook Strait from the top of Mount Victoria; the South Island is visible on a clear day.